I like Veneri, but I don't care for how Curren calls the games. Curren doesn't "paint" a picture for the radio listeners about the weather, environment etc.. and what's going on during the game. It's impossible to get an accurate mental picture of the play being called and developing. Also, Curren doesn't update what the score, quarter or time remaining is until after each quarter. If you just tuned in, you're lost until after the quarter to get any real game information. ^^^ oops, i qouted myself, mistake-mistake. Just come over my uncles house and watch the game with him. He mutes the tv and provides his own “colorful” commentary. If UH is losing and he’s a few beers in, you’ll have a great time haha. That's the kind of stuff I'd rather hear than what the two clowns in the booth say. I gotta say that during the season the BC gotta slightly better and doing his homework but JV might as well be some arbitrary person in the crowd. What I'd like to see is for 1420 to bring in someone from American Samoa to do the color. I started out listening to him at the stadium years ago. Now I can't stand it to the point I leave my radio at home now. Basketball is even worse!!!!!!!!!!!!!!!! I wish they would find a better radio personality for UH football and Basketball games. Horrible. Just horrible. Radio broadcasting or television broadcasting is like any other job. The broadcaster has to work hard by studying the game as well as the team so that they are well informed about the team. In my mind Bobby Curran and John Veneri have not been doing their homework in preparing for the game broadcasts. If you listen to the other team's broadcasters, they give you information about their team as well as UH that gets you excited for the ball game. 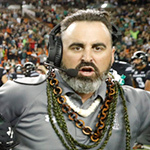 There is just not enough studying on the part of the Hawaii broadcasters to enlighten the non-local fans and local fans about the insides of the game. I don't care if they move on to big time radio and television like Harry Kalas or Al Michaels but just do a good enough job to rival the other team's broadcasters.